Frequency 55 Aspheric contacts are monthly lenses intended for users with low levels of astigmatism. They improve quality of vision, even in low-light conditions. 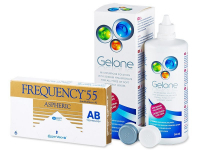 This value package also contains a 360ml bottle of Gelone solution and an antibacterial lens case. Frequency 55 Aspheric contact lenses are monthly contact lenses by CooperVision intended for users with low levels of astigmatism. Unlike common spheric contact lenses, Frequency 55 Aspheric contact lenses provide enhanced vision quality in low-light conditions (ie – driving at night).